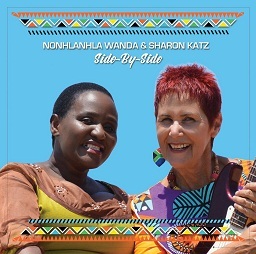 On the 25th anniversary of the original Peace Train tour, Nonhlanhla Wanda and Sharon Katz are releasing their first CD as a duo. Side-By-Side was recorded and produced by Malcolm Nhleko and features Nonhlanhla and Sharon’s original compositions, Sharon on guitar; Qhubekani Mthethwa on bass; Charles Boykie Mnomiya on drums and Sanele Phakathi on keyboards and piano. When Nonhlanhla Wanda and Sharon Katz formed The Peace Train’s 500-voice multiracial youth choir in KwaZulu-Natal in 1993, their goal was to use music to promote the country’s first, fully-inclusive elections and a peaceful transition to democracy. Traveling across South Africa aboard The Peace Train, joined by their friends Ladysmith Black Mambazo, they helped change hearts and minds to prepare communities to live together. Nonhlanhla and Sharon originally trained their choir by traveling to the then-separated communities and schools throughout KZN. After the election, The Peace Train performed for many of President Mandela’s special events and became the first multiracial group to represent the new South Africa on a five-week concert tour in America in 1995. Their first US-release, Imbizo, was nominated for a Grammy for Best World Music. Double Take was recorded with Abigail Kubeka and Dolly Rathebe; Carnival! features The Peace Train along with Sting, Elton John, Tina Turner and Madonna. An award-winning film about their work entitled When Voices Meet features John Kani and Abigail Kubeka. After its World Premiere at the Durban International Film Festival, When Voices Meet was selected for over 25 festivals in America and has been shown in 49 countries in Africa, winning Best Documentary, Best Original Soundtrack, Audience Awards and the President’s Award. The Johannesburg premiere of When Voices Meet was on November 19, 2016, at the Johannesburg Holocaust and Genocide Center. In a recent interview on SABC Morning Live, Nonhlanhla and Sharon said they are delighted to share their story with South African audiences and they also look forward to thrilling audiences with their new Afro Jazz CD and dynamic live shows to celebrate their first duo album and their 25 years of friendship and music. The well-travelled duo have performed in the premiere venues of the USA and they are ready to bring it all home. Singer songwriter Dina Daniels will open the show.